Versatile new bags designed by artists for artists and their tools. Being chained to a desk is hardly the most creative environment. That's why professional concept artist Darren Yeow created the phenomenally popular Nomad Art Satchel Kickstarter back in 2014 to help fellow creatives get out of the door. Now he's back with two new artists' products to build on this success. In the years since launching the Nomad Art Satchel on Kickstarter – a campaign that raised over AU$125,000 – Yeow has been busy building his team and rebranding Nomad (due to trademarking concerns) as Etchr Lab, with co-founder Simon Frisby. With this company, the pair have more resources on hand to create their new Kickstarter products: the Etchr Art Satchel and the Etchr Field Case. With a team of four across Australia and the US, Yeow and Frisby have leant on their team's expertise to design and manufacture the new products. The development of the Etchr Art Satchel and Etchr Field cases was felt to be a timely improvement. 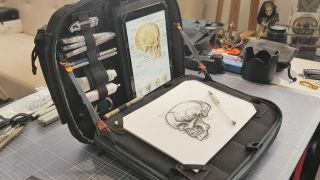 "Like many first-time products, the original Nomad Art Satchel was developed on a shoestring budget while Darren (the sole operator) was still working full-time as a freelance concept artist," says Frisby. The team knew that the original Nomad Art Satchel had some shortcomings to overcome and that they could deliver a quality satchel that can provide artists with an art bag and a general bag in one. "Aside from just wanting to deliver a better art satchel, we wanted to set the foundations so that we can continue to deliver specially designed carry products that make it easier for artists to get out into the world and do what they do best," Frisby adds. The biggest improvement of the new Art Satchel is that it has more space to store art tools and general items. Its redesigned interior system also keeps its contents safely in place, plus there's built-in storage for laptops and drawing tablets. "Overall, this product has just taken the best of the Nomad Art Satchel and levelled-up in terms of functionality, design and quality," says Frisby. "We like to think the functionality and storage capability of our Art Satchel will make it easier for artists to get out into the world and make more art." The Kickstarter pledges for these new satchels are due to go live in the next 24 hours. To find out more about Etchr and its products, head over to the Etchr site. On there you'll also find a link to sign up to the company's mailing list so you can get first dibs on early bird specials for these Kickstarter projects. If the products hit their fundraising target, backers can expect to receive their Art Satchels and Field Cases in time for Christmas.